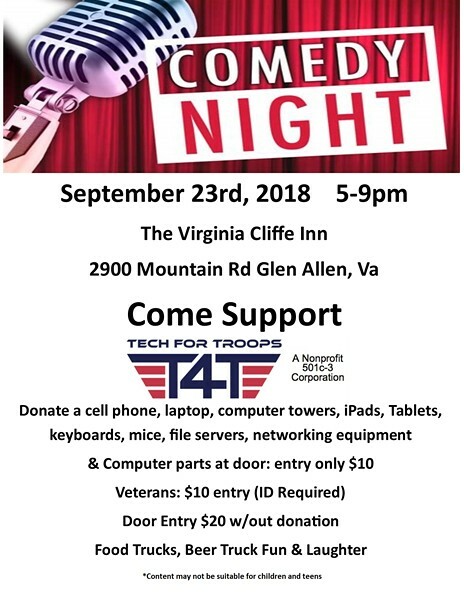 Comedy Night Fundraiser | Virginia Cliffe Inn | Nightlife | Style Weekly - Richmond, VA local news, arts, and events. Come out for a night of fun and laughter. Support Tech for Troops. techfortroops.org. Featuring C.J. Richardson as the headliner https://www.facebook.com/CjTv5/ Donate cellphones, laptops, computer towers, iPads, Tablets, keyboards, mice, file servers, networking equipment and computer parts at the door. Entry only $5 with a donation or veteran's ID; otherwise it costs $10. Food trucks and beer.